Human beings are generally very daring and always seeking for adventure. 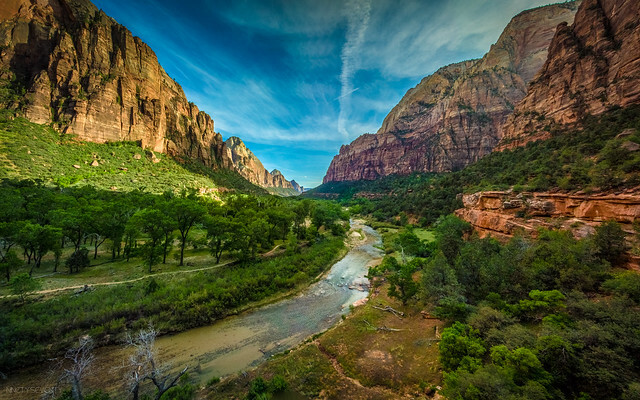 If you are the adventure chasing type, then you must consider visiting the Zion National Park to try out the fun and adventure filled package offered in an around the park. Some of the most interesting adventures in the Zion Park include ATV riding, paint ball, Horseback riding, wall climbing and rappelling, and trampoline bungee jumping. ATVs are very compact toy-like muscle vehicles used to traverse the dense landscape around the park. However, do not let their toy-like nature deceive you. These are custom built full throttle vehicles designed to comfortably blast through the rocky and hilly terrains of the park, and pass through intense stream beds. You would be intrigued by the power and speed of these big toys, as you blast your way through the course. There is even more fun and glory when you decide to get dirty and speed through the mud and make splashes as you go. However, ATV tours are limited to visitors with a valid drivers license or learners permit, and must be over the age of 16. However, smaller ATV’s or Golf carts may be provided for those under 16. You must however agree to the fact that ATV riding might be dangerous, and you are therefore responsible for your actions, and could be asked to discontinue any further participation in the tour, if you are found responsible for any act that may cause possible damage or harm to others or yourself. Paintball is another very exciting activity you do not want to miss while at Zion. There are many courses with a lot of space dedicated just for the game of paintball. Paintball is more exciting here because the arena is naturally designed with lots of obstacles and locations where you can easily take cover or camouflage without easily being noticed, as you take revenge on opponents and cover them up in paint. The paintball ground has been further customized to create opportunities for you to sneak around your opponents and knock them out. In fact, the experience can be measured to that of a US Marshal in combat, but only less dangerous. While at Zion Park, you could test your guts by going visiting a shotgun range. The shooting range is safely located at a considerable distance away from human or animal settlement, to ensure that the only casualties are the targeted clay pigeons or cans. Though hunting is prohibited in or around the park, grab a taste of the hunting experience in this natural environment by shooting on flying cans or clay pigeons that are being thrown across the valley with a provided 20 gauge shotgun. You also have the option of shooting stationary target that have been placed against the hillside. It is possible to bring your own gun for this exercise, but strict rules apply in such situations. If you have a passion for riding on horseback, or maybe you are just eager to learn the art of horseback riding, then you should consider signing up for a horseback riding tour. Zion Ponderosa Ranch resort, working in collaboration with East Zion Adventures, is just one of the many places where you can actually get a one on one horseback riding training with some of the most experienced wranglers you could possibly imagine. Just an hour in the training session could immediately eliminate all your fears about horses, and transform you into an almost perfect horse rider. You would be teamed up with the most suitable young, strong, and well trained horses that would gracefully carry you as you embark on the ride of your life.